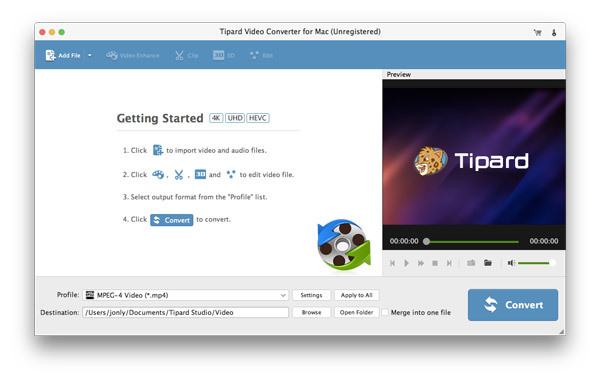 Tipard Video Converter for Mac is used to help users convert any video to popular video (MKV, MOV, MTV, VOB, WMV, AVI, etc.) and audio (AAC, AIFF, AMR, FLAC, MP3, etc.) formats on Mac with the super fast conversion speed and excellent output video/audio quality. What's more, it is highly compatible with iPhone XS/XS Max, iPhone XR, iPhone X. Key Features 1.Convert any video/audio file including 4K video This Video Converter for Mac is able to help users convert any video/audio file, including 3GP, 3G2, AVI, DV, DIF, FLV, SWF, F4V, MOD, MJPG, MJPEG, MKV, VOB, DAT, MP4, M4V, MPV, QT, MOV, RM, RMVB, TOD, TS, TRP, TP, WMV, ASF, MPEG-2 HD, MPEG-4 HD, QuickTime HD, WMV HD, HD TS, HD MTS, HD M2TS, HD TRP video and AAC, AIF, AIFF, APE, OGG,etc audio on Mac. 2. Clip and merge videos Clip a video to your desired time length segments by setting the start and end time. In addition, try to merge different videos to one. 3. Crop Video Frame and Add Video Watermarks Also you can cut off unwanted playing areas of a video to fit your different portable players. Personalize your video with the image or text watermarks, and adjust its position, transparence, etc. 4. Define video or audio effect This software enables you to define the output video or audio parameters, such as Video Encoder, Frame Rate, Video Bitrate, Resolution, and Audio Encoder, Sample Rate, Channels, Audio Bitrate. Also you can adjust the video brightness, contrast, saturation, hue and volume. 5. Convert one file to multiple formats Tipard Video Converter for Mac enables users to select multiple output formats for the source video/audio, and then users can get multiple output video or audio formats at the same time. Minimum requirements: 1GHz Intel/AMD CPU or above, 512MB RAM or more.